There has been much controversy over the years about the disconnect between the 12 Steps of fellowships like Alcoholics Anonymous and Narcotics Anonymous and addiction treatment providers. Often it seems that members of AA and NA feel professionals in the addiction treatment industry don’t truly understand addiction or alcoholism, that they only approach addiction treatment from a medical or a clinical perspective. From the same vantage point, often it seems as though professionals in the addiction treatment field look down at members of 12 Step fellowships or the 12 Steps as a whole, smiling in a condescending manner as they roll their eyes and say things like “12 Steps are nice but it’s not 1970 anymore. We’ve advanced medically. We now have evidence-based practices. We’ve evolved past 12 Steps.” However, the truth is if an addiction treatment program is offering a comprehensive, holistic approach to addiction treatment they will ultimately welcome utilizing the 12 Steps in their treatment approach. 1) Fellowships like Alcoholics Anonymous (AA) and Narcotics Anonymous (NA) are not medical or therapeutic organizations. They do not offer “treatment” or “therapy” in the normal sense of the terms. AA and NA are basically the “last house on the block” for any addict or alcoholic attempting to get clean and sober. The fellowships are spiritual programs (please don’t confuse that with “religious programs). These fellowships offer spiritual programs of action to achieve a lifetime of sobriety through the 12 Steps, meaning that by taking the actions outlined in the 12 Steps and by continuing to take those actions daily and living by principles such as honest, transparency, unselfishness and love that a person can achieve long term, sustainable sobriety from drugs and alcohol. 2) Addiction treatment and the 12 Steps are different. Addiction treatment deals with many different modalities and philosophies. Addiction treatment utilizes individual and group therapy, looks at issues of trauma, abuse, neglect and harm. Treatment and therapy examine personality disorders, behavioral disorders and mental disorders. They use educational and preventative techniques. There are also many different levels of treatment, from detox to inpatient to partial hospitalization (PHP) to intensive outpatient (IOP) to outpatient. This is separate from the 12 Steps, which utilizes the single approach of the same spiritual principles (the 12 Steps) for anyone. Of course, the difference or “individualized” approach occurs in the person taking the 12 Steps themselves, meaning that one person’s journey of sobriety will look different than another person’s journey, but the principles (the approach) are the same. 3) Not everyone that goes to an addiction treatment center necessarily needs to go to a 12 Step Fellowship. Many people that get addicted to drugs or suffer from a substance abuse issue or a substance use disorder can get better without the use of 12 Steps. Many people use drugs because of past trauma or abuse or family issues or emotional or mental disorders as a coping mechanism. These people need help and many people can get better simply through good quality, comprehensive addiction treatment. Many people can get better through therapy. These people do not need the 12 Steps. However, many more people cannot seem to get better by these same means. Many addicts and alcoholics have reached a point where they need more help. This does not mean their outside circumstances, such as reaching a point of homelessness or joblessness, but rather they’ve reached an emotional and mental point that requires more than treatment and therapy to heal. These people often do need treatment and therapy, but in conjunction or afterwards they need the 12 Steps. They need the spiritual awakening or the “physic change” that occurs from taking the steps. Any good quality comprehensive addiction treatment provider will incorporate some area of the 12 Steps into treatment. Whether it’s just a basic education of what the 12 Steps are, some learning about the fellowships or even an experiential treatment dealing with the 12 Steps, a good quality treatment provider should incorporate some level of 12 Steps into their treatment approach. It would be asinine for an addictions treatment provider or a drug rehab to reject the most effective, widespread model for helping addicts and alcoholics that exists on this planet. Most drug treatment centers suggest their patients go to “outside 12 Step meetings”, so a good treatment center will understand the 12 Steps and incorporate them into treatment. Of course, there is some bias against the 12 Steps and the 12 Step fellowships. Some look at these organizations as cultish or religious. They are not, although some groups can lend themselves to that type of behavior. Those groups should probably be avoided, as it would seem they have missed the point entirely. That being said, some treatment centers will purposefully not directly correlate the 12 Steps into treatment. That is somewhat understandable. However, a good comprehensive treatment center will openly discuss the 12 Steps and certainly discuss similar principles in recover. Examples of such principles are honesty, open-mindedness, willingness, unselfishness, brotherly love and service to others. Be wary of any treatment center that outright rejects this model, as it would be assumed there is certainly an unknown ax to grind. 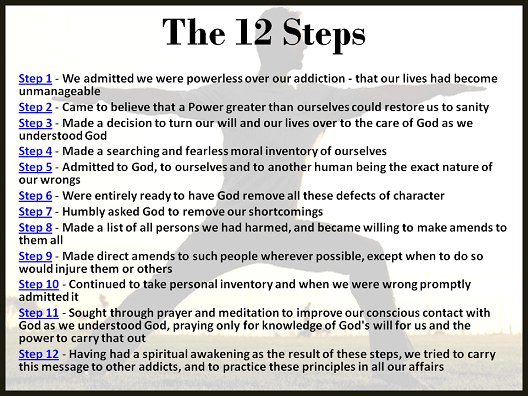 The 12 Steps are simply a group of actions, spiritual in nature, whose purpose is to expel the obsession of drugs and alcohol from a person’s mind and aid them through those same actions to create a healthier, less selfish outlook towards life. Any good addiction treatment center will support and incorporate the 12 Steps and will actually work comprehensively with those close to a patient that are in AA or NA (meaning a sponsor and a sober support group.) They will try to aid each other in what is best for the patient, since AA and NA are not treatment and often both can be helpful. Because when it comes to addiction and alcoholism, isn’t the read aim to be helpful in getting the suffering patient better?